Ok so I am continuing my quest to get the wedding album done. I feel like the stupid energizer battery bunny. If I wasn't on such a time constraint it would probably be easier, but I do this to myself alot. LOL I am an admitted project masochist. One thing I have found is that having page sketches has definitely helped speed things up. I am keeping the entire album very simple and have decided to use the same 3 patterned papers and only two colors of cardstock for the whole album. 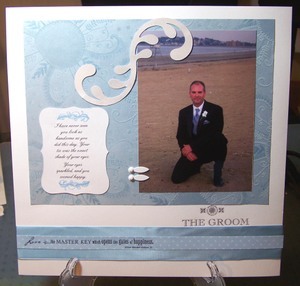 Here are my Bride and Groom pages. 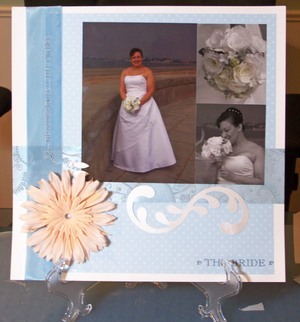 Both pages have a white cardstock background and use a wide blue satin ribbon. I also tied these two pages together with the flourish and used the same two patterned papers for the pages. Check back later tonight and I will have more page layouts to post.